The Brooklyn Public Library (BPL) wants to make it easier for incarcerated New Yorkers and their families to stay connected. In order to supplement expensive phone calls and sporadic in-person visits, the BPL is launching a free video visitation program in 12 of its libraries. The Verge reports that TeleStory will provide cozy spaces for family members to talk to inmates. The BPL launched TeleStory at its main branch in 2014, and was recently awarded a $393,249 grant from the Knight News Challenge to expand the program to other locations. While TeleStory will benefit all friends and family of incarcerated New Yorkers, it’s specifically geared toward children. 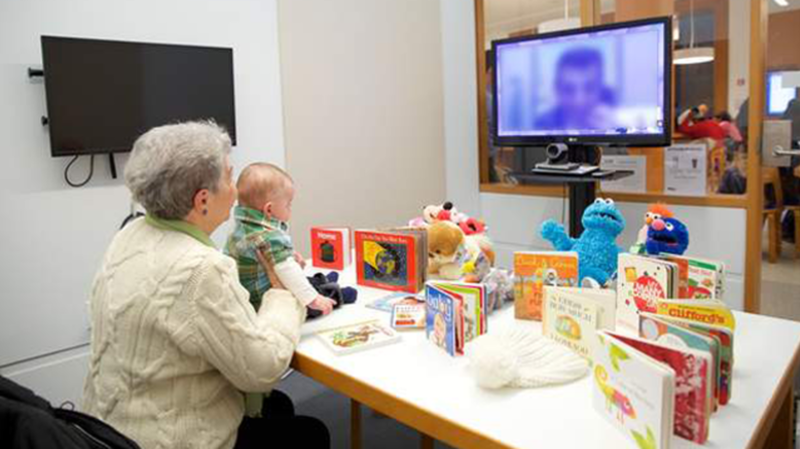 In addition to creating video chat facilities, the BPL will fill video chat rooms with books and toys, and inmates will also receive a set of children’s books during their call so they can read to their kids. TechMic explains that, while some jails already offer video chat services, these are often low quality and can cost up to $1.50 for each minute of glitchy, low resolution video. Meanwhile, visiting loved ones incarcerated on Rikers Island often involves a grueling and time-consuming commute involving multiple buses and trains, which can be difficult for many to make on a regular basis. By contrast, BPL video chat will be local and free, and the BPL will specifically prioritize neighborhoods with higher rates of incarceration to make it as convenient as possible. The idea, according to Nick Higgins of the BPL, is not to replace other visitation services, but to supplement them. The Brooklyn Public Library is just one of the many libraries across America that have expanded their community services far beyond book-lending. Many libraries provide employment services, computer classes, food, and even job interview attire for community members. But the BPL’s TeleStory program doesn’t just provide services to library patrons, it also addresses some of the problems with the prison visiting system, seeking to provide a more positive visiting experience. "It's an intentionally human experience," Higgins told TechMic. "Anything that we do in jails or marginalized communities, we want to create a sense of belonging and inclusion. How life should be."